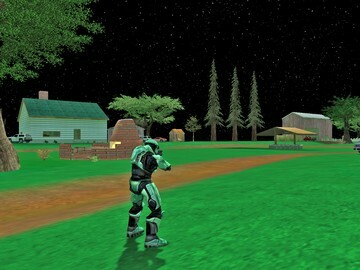 Game Types: Race, Ctf ,Oddball, King and Slayer. All work excellent. I recommend playing all 5. Vechiles: You can not fall out of the vehicles, you will manually have to eject yourself from them, being said, Race vehicles are the Rocket Hog. The hogs have been set to knock your opponents hog off corse rather than to kill them. You will be intertained, I promise. Map Recommendations, 4 - 6 would have a good balance but the more the better. Known flaws: 6 beta testers played this map , after fine tuning it best I could we got to a really nice playable and enjoyable map. If there is any flaws id have to say , i had to create a scenery ladder to get up into the hay loft. However it serves its purpose well. 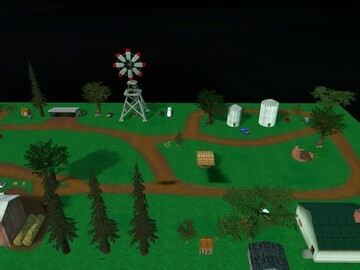 to complete the map i also had to create several other scenery tags . You are welcome to extract this map if you so wish. ( small hay bale , crapshack , cemetery , round hay bale , ladder, firepit ,metal and wood crates ).